The $71 million Brookline, Mass., credit union has launched a mobile branch service. 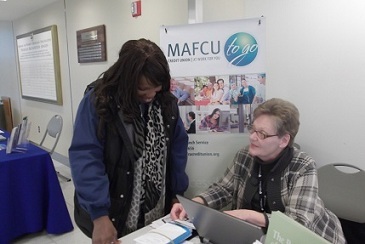 Branch manager Kathleen Lewis, at right, works with a member who stopped by the MAFCU to Go mobile branch. With a membership heavy in healthcare and hospital work, Medical Area Federal Credit Union decided to take its services to the workplace.